The Rottweiler Husky mix, sometimes referred to as the Rottsky, is a rare, unique hybrid that’s often tough to find. These dogs end up with expressive eyes and a very unique personality, providing a beautiful, loyal, and loving pet. Of course, as with all mixed breeds, they have the potential to take after either parent breed, so many characteristics will be tough to predict. However, to help you decide if the Rottsky is right for you, here’s a closer look at some helpful information on their origin, potential appearance, temperament, health, and more. While the Rottweiler Husky mix is recognized by the Designer Breed Registry and the International Designer Canine Registry, there’s not a lot known about when it was first created. It’s likely that it was created within the past 20 years, since designer dogs became popular during the last couple decades. However, these dogs are still quite rare and we don’t know a lot about why they were created or when. Still, we can learn more about the Rottsky by looking more closely at their parents. The Siberian Husky, bred to be an endurance sled dog, traces all the way back to Siberia and has probably been around for thousands of years. 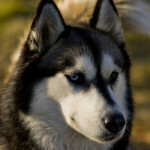 During the 20th century, these dogs were eventually imported to Alaska, where they were also used as sled dogs, both in competitions and in other capacities. During World War II, Siberian Huskies were also used as part of a search-and-rescue unit in the Arctic Circle. The Rottweiler also has a long history, and experts think these dogs can be traced back to drover dogs the Romans used to help move livestock. The dogs were used to help work cattle, helping to drive them to market, and were eventually called the Rottweiler Metzgerhund, which translates into the “Butcher’s Dog.” Railroads eventually eliminated the need for these cattle driving dogs, leading to a decline in the breed. However, later they would resurge in popularity, being used in World War I by the German Army. In 1931, the Rottweiler was added to the AKC’s Stud Book. However, it wasn’t until 1971 that the American Rottweiler Club was started. When the Rottweiler Husky mix is just a puppy, they usually look like a fluffy Rottweiler with the eyes of a Husky. These dogs generally have partially dropped ears, a head that is shaped like that of a Rottie, and a muzzle that’s just a bit longer. Of course, individual dogs can take on any of the physical characteristics from the parents, which means these dogs can vary in appearance. Generally, the Rottweiler Husky mix will grow up to be between 21 and 26 inches in height, and they usually weigh somewhere between 50 and 100 pounds. Their coat often looks more like a Husky’s and is a bit longer than the coat of a Rottweiler. The color of their coat can range in color, including colors like brown, black and tan, white, black, red, and gray. The Rottweiler Husky mix is usually alert, intelligent, social, brave, independent, and loyal. Since the Rottsky tend to be a bit wary of strangers, they can make great watchdogs for your family. While these dogs are not considered dangerous, they should be supervised around very young children, something that is true for any breed of dog. Since both the Husky and Rottweiler are known to be a bit stubborn and independent, the Rottweiler Husky mix may be a little tough to train. Training your Rottsky puppy will take some patience and time, and it’s important to start training as early as possible. Keep sessions short to avoid boring puppies and make sure you use plenty of praise and positive reinforcement with these dogs. Expect your Rottweiler Husky mix to be very active, since both of the parents are active dogs. They need plenty of exercise and playtime. The Rottsky will love going jogging, hiking, or walking with you. Playing outside will be excellent for your dogs as well. Huskies shed moderately throughout the year and Rotties shed seasonally. You can probably expect some shedding from the Rottweiler Husky mix, so brushing their coat several times a week is a good idea. You’ll only need to bathe these dogs as needed. Regular ear cleaning, teeth brushing, and nail clippings will also be needed. The Rottweiler Husky mix may do well as a watchdog. However, most of the time these rare dogs aren’t used in working roles and are best suited for loyal, active pets. Did you ever find another one? Where are you located? I know of two 11 month old females that need adopting in CA. Do you know if they are still available. We are in Northern Cal. I bought a rottsky pup 7 mnths ago and she is a beautiful dog. 2 mnths ago we learned her husky father was a x wolf. We now understand why she gets bored and wants to walk and play constantly. If we go out she will eat anything available….socks, shoes, skirting boards. She is so well behaved when she’s not on her own. She does her tricks for a biscuit. The love she has for us is just amazing. She will pin me to the couch when I come in from work and lie on top of me licking my face until I have to breathe again. These dogs need a lot of time and patience. We see a lot of wolf characteristics in her. She’s a pouncer and she will dig anything until she finds what she’s looking for. We absolutely love her. She’s a character and sometimes she outsmart us. Thank you for sharing your story Elaine. I have a male rotty/husky. Mother is a rottweiler and and father is a Siberian husky. Duke is 6 years old. He’s a big boy, 27″ tall and 110 pounds. Mother 75 pounds father 45 pounds. All 5 males large (mother’s father 140 pounds). I have the largest first born male. The 5 females are smaller, shorter fur like mother. The males are all fluffy fur like the father. Duke is an absolutely gorgeous dog. He is lovable, friendly, very social and protective of me. He loves playing with other dogs. He adores his parents (my son has both mother and father). He thinks he’s a lap dog. He sits with me, sleeps with me and watches tv. He has never even made an attempt to bite or hurt anyone. Anyone can pet him but I can’t pet another animal. He will body slam them away from me and bark at them. He will scare you within an inch of your life if you step on our property. I don’t let people know he just barks. I want them to think they can’t assume they can step on my property. Wherever we go people are always petting him or giving him a treat. My vet says he will defend me should the occasion arise and that I shouldn’t be fooled. I make sure men don’t get close. He seems to know women and children are okay. He gets between me and men all the time. All his siblings are the same. None of them have had formal training. They are in loving environments where they are the center of attention which probably attributes to them behaving so well. I strongly recommend this breed. I absolutely adore my dog. July 1, 2016, I adopted a 4 month old Rottsky pup from a local animal shelter. She (Kiki) is one of the sweetest natured dogs that I have ever had. She is currently being trained to be a service animal and her trainer said she has the perfect temperament for the role. She is playful and very intelligent. Training is a little slower as she does have the times of stubbornness that is typically associated with Rottweiler’s, but she does learn easily. At 11 months old, she has already shown an awareness to spot when her aid is needed. She loves cuddles and is very gentle with my grandchildren. Her favorite place in our home is to curl up on the couch beside me. She is protective, yet not aggressive with strangers who come onto our farm property. She barks to alert, but goes no further. She loves going on outings and even this early in her training, she is very well behaved when she accompanies me in stores or other public places. I’ve worked with and trained many dogs over my lifetime and she has been a joy to work with. Once she understands a boundary in behavior, she is obedient to that boundary. In training, she responds best to praise. Like with any dog, consistency is key. Overall, she is the best breed of dog that I have ever had the privilege to have in my home. Looking to adopt a Rottsky puppy! If anyone knows where I can find one, please let me know! Thank you! I have rottsky puppies. I didnt plan to breed them, it was sort of an accident before we spayed our dog. Im looking for good new homes for the puppies. Im in Indonesia though. I am looking to adopt a Rottsky. We have had 2 Rotts and want to try this variation. We are in Northern California. We are located in Chicago, Illinois. Our pure breed Siberian Husky Felix & pure breed German Rottweiler Roxie are expecting puppies mid December 2018. Message me if interested. I have a rottsky male who has been a very faithfull friend,has protected my wife who is disabled and has been her unofficial work dog. He will stand next to her when she falls and when she goes up steps he goes ahead of her and lowers his tail so that she can grab his tail to help her up the steps. She sometimes gets real bad leg cramps and he will lay on her legs to warm them up to stop the pain. I also live in the country and my neibors had groundhogs real bad but he took care of them.All he ever wants to do is hunt. He is 13 now and still the most beautiful faithful loving dog that he has allways been.